FREE WIRELESS INTERNET ACCESS PROVIDED!! 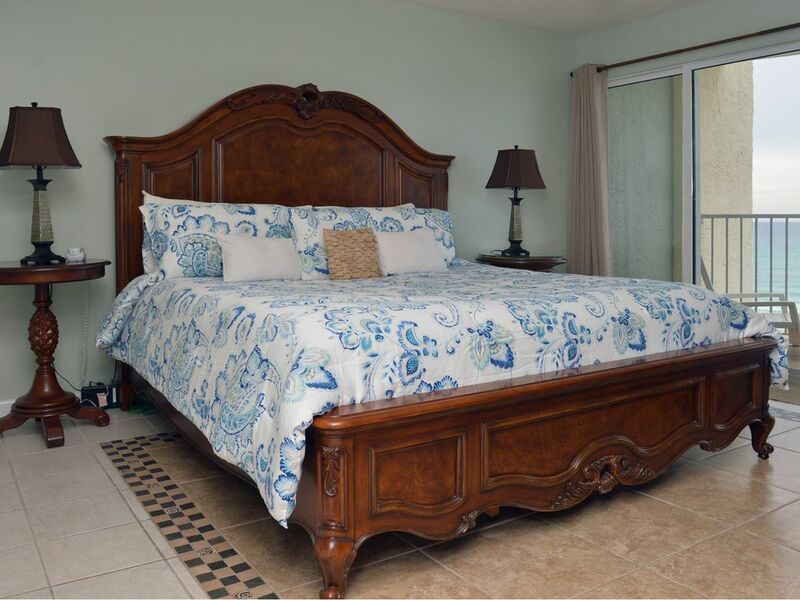 RELAX, ENJOY, GO BAREFOOT in our one bedroom condo located on the fifth floor at Long Beach Resort. The fully tiled floor feels cool under foot. There are fabulous gulf-front views from both the living area and the master bedroom, and the fresh coral mist walls and decor give you the feeling of a Caribbean Island vacation. The bedroom has a grand king bed and the bath has double vanities and a garden tub. The living room has a brand new sleeper sofa and a new swivel rocker. Perfect for watching TV or curling up with a good book. Try one of the areas many restaurant's or eat in. This condo has a full kitchen and seating for 4 at the table, inside or on the balcony. Breakfast on the balcony, fun in the sun, sharing a magnificent sunset, a good night’s sleep on the grand king bed, waking-up and beginning the adventure all over again. Sound good? Come on down! Long Beach Resort sits directly on the Gulf of Mexico's sugar white sandy beaches. The resort features 2 Polynesian pools (seasonally heated), 3 Jacuzzi spas, and a 6800 square foot lagoon pool complete with palm tree islands, waterfalls & lush tropical landscaping. The Hang Out Bar and Grill is conveniently located at the Lagoon Pool. Long Beach Resort has security 24 hours a day, 7 days a week. Parking is directly in front of your building -- not across the street -- not in a high-rise tight-spaced parking garage! Beach Service offers rentals for chairs and umbrellas, jet skis, parasailing, etc. This is a NON-SMOKING Condo, PETS are NOT allowed, and RENTER must be 25 years of age or older. We build our reputation on clean, well maintained condos. Super-Wal-Mart, restaurants, and shopping are within walking distance. Golf, zoo, Shipwreck waterpark, Pier Park outdoor mall, theaters, and Ripley's Believe It or Not are just a short drive away. The condo was beautiful and very well kept. Maureen was super to work with and very helpful. She was extremely prompt in getting back to any questions that I had. Definitely will be coming back!!!!! Very nice condo, large deck with an awesome view !! Thank you for taking the time to write a review of the condo. So happy to hear you enjoyed your stay. The view is amazing!! From our bedroom and the living area.. Barefoot Beach was very easy to work with. We had a small issue and they took care of it within an hour. It had a great tv as we are huge basketball fans.. The complex is still trying to recover from Michael but they were working hard.. We definitely enjoyed our stay and will be back.. Thank you for taking the time to write a review of the condo. Please contact us again the next time your travel plans bring you to Panama City Beach. Absolutely the perfect get away!! Thank you for taking the time to write a review of the condo. We are delighted to hear you enjoyed your stay and look forward to hearing from you the next time your travel plans bring you to Panama City Beach. Labor Day weekend beach trip... the beach and the beach service was great! Would stay again. Thanks. Thank you for taking the time to write a review of the condo. Please contact us again the next time your travel plans bring you to Panama City Beach. Delighted to hear you enjoyed your stay. Condo was excellent! The view was excellent! Location was excellent! We loved our stay at Long Beach Resort! The pool was beautiful and it was such a family oriented resort, I liked that. We also loved that beach chairs and umbrella was included with our room. The room was very nice and spacious. The balcony was perfect, view was terrific! We can't wait to visit again. Thank you for taking the time to write a review of the condo. So glad to hear that you enjoyed your stay. Rates are subject to change until confirmed. We accept Visa, MasterCard and Discover.